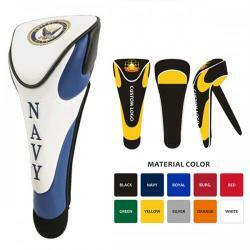 Put your logo on our wide selection of Logo Golf Head Covers for your next golf tournament, event, outing or promotion. Customized Golf Club Covers are available for your Driver, 3 wood, and 5 wood. We also provide customized head covers for hybrid clubs and also for custom putter covers. 4. Your customized golf head covers will be produced and shipped followed by a tracking number sent by email. Custom Compact Barrel Embroidered Golf Hybrid Cover - Golf Tournament Gifts.. Custom Deluxe Mesh Embroidered Fairway Golf Head Cover - Golf Tournament Gifts.. Custom Logo Embroidered Synthetic Suede & Fur Golf Club Cover. 18" synthetic suede and fur headcover with knit sock, standard size. Also available in oversized version. Make great gifts for your next golf tournament. ..
Our exclusive club covers collection line featuring our new synthetic leather and mesh driver cover! Classic driver cover design with a synthetic leather face and mesh back. 8" Flexible black knit sock. 2 Areas of embroidery at no extra charge and no setu.. Golf headcover, 100% hand-made leather, The headcover will not fade in the sun, The headcover will not stretch out, Elastic built into the headcover for a firm fit.. Custom Logo Leatherette Blade Putter Cover . Great Personalized Golf Gift! Cover your Blade putter and display your logo on the golf course. Made in Canada! .. Custom Logo Leatherette Putter Cover Mallet. Great Personalized Golf Gift! Cover your Blade putter and display your logo on the golf course. Made in Canada! ..
Our exclusive club covers collection line featuring our new magnetic closure blade putter cover! Exclusive magnetic rear opening closure for easy access. Made of synthetic leather for long lasting durability and reduced weight. Trendy design for a fractio.. Custom Logo Magnetic Closure Golf Head Cover uses a powerful series of magnets embedded in the padded neck providing the user "quick release" access to his/her oversized driver. Standing over 14 inches tall, 5 inches wide and 6 inches deep, our magnetic c.. The Magnetic Closure Fairway Cover uses a powerful series of magnets embedded in the padded neck providing the user "quick release" access to his/her fairway wood. Custom designed using your logo colors. Let you mind go wild. Free tape charge and low mini.. The Magnetic Closure Hybrid Cover uses a powerful series of magnets embedded in the padded neck providing the user "quick release" access to his/her hybrid wood. Custom designed using your logo colors. Let you mind go wild. Free tape charge and low minimu..
Our exclusive club covers collection line featuring our new magnetic closure mallet cover! Exclusive magnetic rear opening closure for easy access. Made of synthetic leather for long lasting durability and reduced weight. Trendy design for a fraction of t..